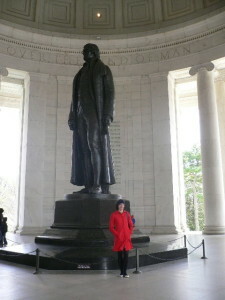 Ngaire stands alongside the imposing statue of President Thomas Jefferson, Jefferson Memorial, Washington DC. Thomas Jefferson was the third President of the USA, serving from 1801 to 1809. He was born in 1743 and is remembered for his role as a ‘founding father’ and author of key founding documents. 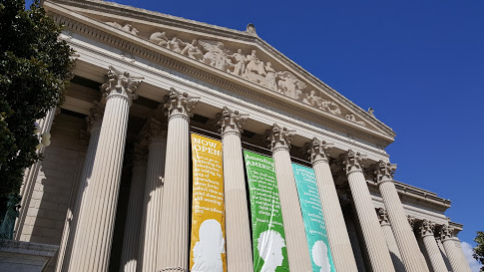 These include the Declaration of Independence which, incidentally, can be viewed by visiting the National Archives. (Nicholas Cage steals the Declaration of Independence in the movie National Treasure, and replaces it with a copy purchased from the bookshop, always a bit of a stretch). Jefferson died in 1826. The Jefferson Memorial was built between 1939 and 1943. The huge bronze statue of Jefferson was erected in 1947.